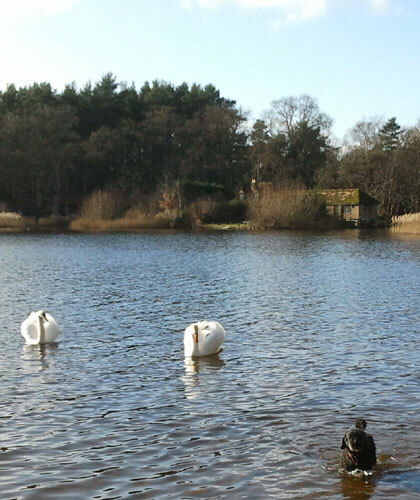 Almost at the end of our walk around Frensham Little Pond today, Carmen decided to jump into the pond, off a high brick wall, in order to attack a pair of full size swans who were placidly wading around. When Carmen realised that the water was actually quite deep not very far from shore, she decided to turn back. Here she is heading back, as the swans realise that she is more a fish out of water than a dangerous hunting dog out for swan neck. During our walk, the weather was lovely but it hadn’t been like that for most of the day. The morning was quite miserable! Well, except for the fact that it didn’t rain. It was still miserable though. In fact, because I had to go to the post office and I forgot it doesn’t open until 9am on a Saturday, I was forced to go for a wander while I waited the half an hour I was early. I generally have my camera with me so I snapped shots around the church. Sadly, because it was so grey and gloomy, the photos all lacked any life and have since been deleted. I did manage one for my blip and the church above but otherwise…like I said, it was miserable. But that all changed after lunch when the clouds decided to venture to other points of the compass, leaving the sky blue and crisp and the sun shining brightly. We took immediate advantage of it and headed for Frensham. It’s the first time since the fire that I’ve been up to the ridge where the bronze age burial mounds are and, what once were mere marks on a map and covered in gorse on the hill are now vivid mounds proclaiming the strength and power of their inhabitants. As they should. OK, I’m not keen on the fire and, obviously, it was an awful thing but the mounds have reclaimed their power over the countryside. That I really like. In the bronze age, men and women of power were buried high on hills for everyone to see. Far off tribes would approach and, in viewing the long line of dead ancestors high up in often inaccessible places, would possibly turn around and go home again. These human-made mounds were symbols of strength and wealth and everything important for a tribe to grow. They are now, once again, how they should be. The mounds aside, we took the long walk through the mud woods and down to the back of the pond, finally walking the circumference, back to the car. Exhilarating. Congratulations to Claire who has been sent home! I knew you could do it. This entry was posted in Gary's Posts and tagged burial mounds, Carmen, Frensham, swans. Bookmark the permalink. Your dad!!!!! but good on Claire does she have to go back later? The swans were substantially bigger than Carmen. I think she only realised that as she approached and that was what made her turn back – not the water. We could roast a swan (like they used to) and fit a cooked poodle inside! 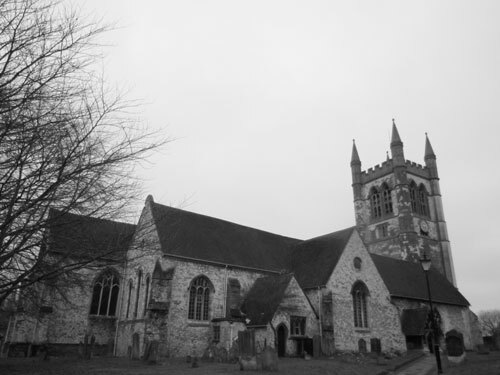 The pik of the church looks eery – it looks like black and white film. But it’s not. That’s the problem with February here. It’s like living in a black and white film, devoid of life.